In June 2010, the General Services Administration (GSA), on behalf of the United States Attorneys Office, issued a solicitation for offers on 32,552 square feet of office space in Muskogee, Okla. US Federal Properties (USFP) submitted its best and final offer in October 2010, and was awarded the project in May 2011. USFP was selected based upon quality, price and a clear understanding of the client’s needs. Three blocks north of the U.S. Federal Courthouse, the new Department of Justice Office is near Muskogee’s central business district and adjacent to the city’s major retail centers. Design was implemented to provide a quality working environment for users while incorporating the ecological diversity of Oklahoma and its rich Indian Tribe history. The building’s exterior columns are reminiscent of those at the entry of the Federal Courthouse and reinforce the federal character of the facility while remaining current. The project was completed in July 2013, with the facility being fully operational shortly thereafter. It serves as home to the U.S. 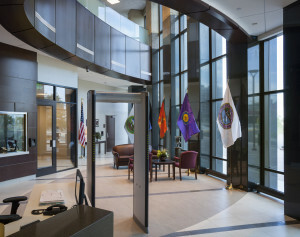 Attorneys Office for the Eastern District of Oklahoma and meets LEED Silver Certification, having been developed with sustainable design and energy efficiency features for water, electricity, indoor air and materials, recycling and storm water quantity/quality.